Those Montana headlines greeted us a few days ago. This must have been one dangerous bear. Intrusive. A “problem bear.” An habitual offender. But hang on…we’ll have to go way back to 1988 and ’89 (when Griz was an impulsive juvenile) for that “history of conflict.” Since then–a span of some 25 years–the bear lived within Yellowstone National Park boundaries and “was not involved in any other management conflict actions until the incident this week.” The news release further reveals that the bear was captured after attempting to break into a building containing horse grain in Jardine, MT, a mere stone’s throw from the Yellowstone border. The way I read that, “attempting” to break in means he didn’t actually break in. Can’t we cut the old guy some slack? This was neither a good nor happy death for a bear whose “history of conflict” amounted to two incidents a quarter century ago. And while his age and physical condition are cited as additional reasons justifying his death, setting up death panels for elderly wildlife is not the state’s job. “So they killed the bear for being a bear,” posted an online commenter to one of the numerous and unquestioning media regurgitations of the agency’s news release. 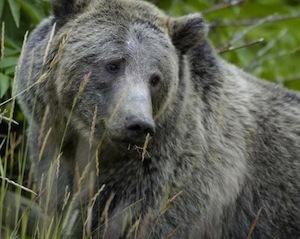 While grizzlies can live to be 30 in the wild, according to the National Wildlife Federation, most die before age 25. This old soldier might have succumbed to his age and the coming winter anyhow, but how I wish his long life could have ended in his home–the wild environs of Yellowstone–lulled to eternal sleep by the wind and the snow, his body recycled by his neighbors, the scavengers, according to nature’s design. This would have been a good death. The agency laboratory in Bozeman is no country for old bears. “setting up death panels for elderly wildlife is not the state’s job” – that’s a good way to sum up a bad practice … I fully agree with you, Kathleen! I am saddened, but not surprised by this news. It is just like humans, and the government to deem the bear a problem or nuisance for doing nothing more than trying to feed itself before a long cold winter. People need to remember that WE force wild animals to behave like this when we steal their natural habitats to build our own. There’s quite a simple solution to much of this. If you are one of the “new” Westerners (what I fondly refer to as “lifestyle relocaters): Buy or build your house in town. We have many nice towns and small cities here with lots of quite pleasant tree-lined streets. My family and I live on just such a street. That way, we can leave the countryside for agriculture and critters. Plus, if you live in town, seeing a movie or running out of toilet paper needn’t prompt a major expedition — thereby causing you to burn more gasoline (you know, that whole carbon footprint thing) and possibly even run the risk of driving into and squashing (or in the case of the big ones) having your car squashed by said wild critters. Living in town, I have only to take a short walk or hop on my bicycle to avert a toilet paper crisis, get to and from work.. and so on and so forth. Now, I’m not holding my breath waiting for newcomers to quit insisting on “country” homes — and then turning around and wailing about wild critters. It likely never occurred to them that’s it’s entirely possible that this old bear … somewhere along the line … taught his progeny to avoid conflicts with humans. Probably why he lived so long. Isn’t it time to get these hunters out of wildlife agency positions?? Boar grizzlies typically have nothing to do with their offspring. Not that I believe in entertaining anthropomorphic ideals about animals, but in human terms, they would be among nature’s ultimate “(bleep) and run” deadbeat dads. When they do interact with cubs, alpha male boars are just as likely as not to kill them, if and when they catch the cubs outside of their mothers’ protection. In fact, one Mama Griz’s most important job is protecting her cubs from boars. And some of the finest biologists I’ve ever known worked for various state and federal wildlife agencies. I wouldn’t be so quick to slam them, unless and until you’ve actually sat down and had a conversation with one.